Wishbone Ash, the classic British rock band renowned for its signature twin-lead guitar prowess, embarks April 25th on a US tour to promote a new DVD and studio project. The group returns to several familiar venues along with select new stops on the three-week tour (tour dates listed below). 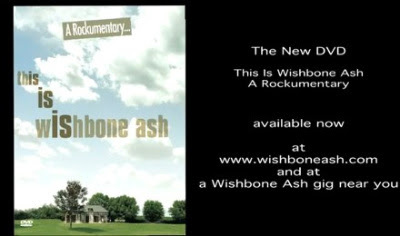 The DVD, "This Is Wishbone Ash", is a rockumentary offering a “fly on the wall” glimpse of the creative process, as the band records tracks for the upcoming CD release and prepares for a concert. Wishbone Ash plans a late spring-early summer US release for the new CD (working title: "Searching For Satellites"). The album features brand new tunes from the pen of founding member Andy Powell (guitar, lead vocals) and Muddy Manninen (guitar, backing vocals), with input from bassist Bob Skeat and drummer Joe Crabtree.